Oh Portland….how I love you! Somehow we made it safely to Portland in under 20 hours from Salt Lake City with two young kids and one driver (Mapquest it….it’s impressive). We stopped along the way to check out the Columbia River and a fish hatchery, but mainly, it was a long day of driving. By the time I got to Portland, I really wasn’t mentally prepared to learn a new city’s parking system, particularly one as, shall we say, bike/walk encouraging, as Portland. But from the moment we arrived, Timbers Army members were nothing but amazing. We got parking help from one fan, who helped us find the line for early entry wristbands. 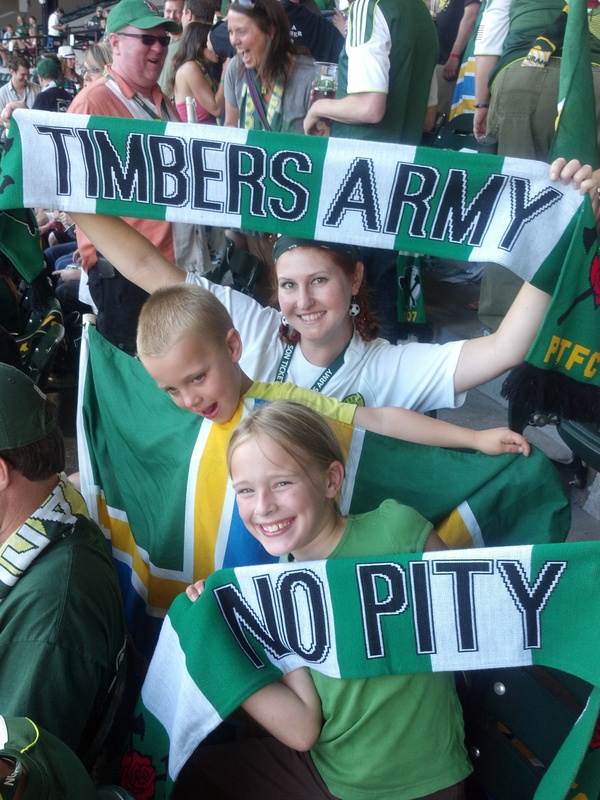 Then other fans pointed us to the Timbers Army merch van, where we glutted ourselves on scarves, stickers, and shirts. As if this lovely lady welcoming us wasn’t enough, things were about to get even better. My goal for taking my kids to Portland was to show them the height of supporters clubs. I wanted them to see a club that sings the whole way through with tradition and wonderful stuff the whole way through. We’ve taken them to some great games with fantastic supporters, but I’ve never had an experience like the one I had in Portland in 2005 when they were playing on a baseball field and still in the A-League. I had to see for myself how they’d developed, and wanted to share with my kids what I consider to be the best supporters group I’ve ever seen. Enter Phyllis, previously a stranger, and our initial seatmate. Phyllis took to our little group right away. When she heard we’d traveled from Des Moines mainly for this game, she became our Timbers Army concierge. She got us song sheets and started teaching the kids the various Timbers Army traditions, such as changing the last line of the national anthem to “home of the Timbers.” She helped them tear up confetti for the end of the anthem. She taught them about all the things they should do as supporters. It was amazing. My kids have been to dozens of soccer games, but I’ve never seen them so engaged as they were after Timbers 101 with Phyllis. The game was exciting. Portland had so many chances, 20 shots by the end of the game, and after every one, I had to turn around to and count off the near misses to Phyllis, who had moved a few rows back to be with her injured husband. We got to learn the Timbers two new songs as well as their old favorites, including Tetris. The Timbers Army sings through the entire game, including a call and response with the entire stadium. When Chivas scored the game winner in the 69th minute, the Army put their scarves up and kept right on singing. It was a beautiful show of support for their team, and I loved it almost as much as their show of discontent with their current coach, recently installed rather bluntly by management, after the game. “We just drove 2500 miles to see our team lose.” She smiled at me halfheartedly. Then I said, “You know what that means? 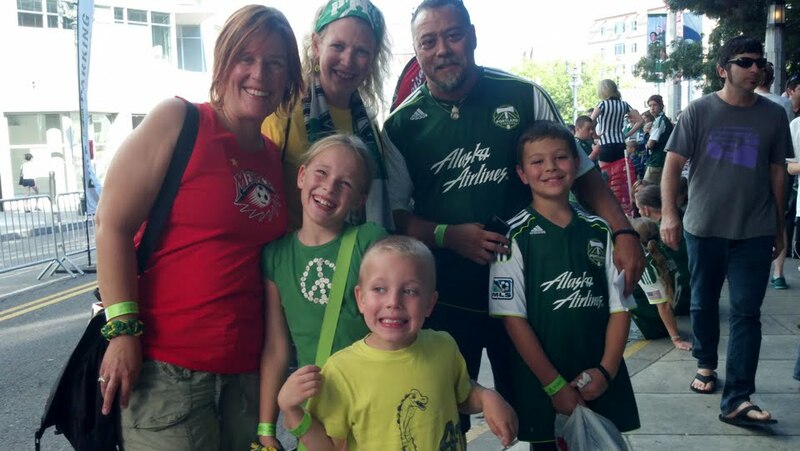 …..We’re going to have to come back.” The Timbers Army showed us such great hospitality, we barely noticed the loss. I’d gladly do this drive all over again (or maybe we’ll fly next time…) to come back for more. Thanks Timbers Army. I waited seven years to rejoin your ranks, and it was absolutely worth the wait. We rolled into Salt Lake City later than we wanted, only to find out the game was an hour later than I thought (yay time zone change!) We got the info on the tailgate from Twitter via @RSLRoyalArmy and got waved into parking by the attendant impressed that we’d driven from Iowa for the game. We ended up parking next to a group of supporters that were having “LDS Singles Night” which entailed green jello shots (complete with carrot shreds!) and funeral potatoes with braiding each other’s hair replacing the usual kick around. The tailgate ranged from that group, to Royal Army members, some Salt City Outlaws, to Salt City United, a group of tattooed group of supporters that seemed less than excited to talk with a not tattooed mom of two innocent looking blond children (little did they know…but more on that in another post). We found tickets, joined the Royal Army (because the answer to do you want a scarf for $25, or a scarf, patch, and RA membership for $25 is heck yes I’ll join the Army). We went into the stadium, and the supporters section was divided up with the stage for Neil Diamond’s concert the next day. We started out sitting to the left of the stage with a group of season ticket holders that seemed nice…..too nice for us. As game time approached, we heard drums and trumpets from the other side of the stage, which was the only invitation my son needed to march on over and join La Barra, the Latino supporters. The kids loved the atmosphere at Real Salt Lake. Between the two levels in the supporters section, there’s a terrace where kids from all over could run around and play. Both my kids found children to chase around or make confetti with, in between dancing to the constant music from Barra and spinning through the smoke bombs. While the kids were excited to participate in the festivities, I was excited to have two USMNT players on the pitch, Jay DeMerit for Whitecaps and Kyle Beckerman for Real, or as the kids know them, “that guy from the movie (Rise and Shine)” and “the Jewish player.” I do appreciate having players for the kids to look up to, and since they live in a smaller city soccer-wise and they’re Jewish, we couldn’t have picked a better match to kick off the MLS Roadtrip, role model wise. Cap off the night with a 2-1 win for the home squad and I would call this an entirely successful trip. The only downside is in order to make Portland in time for the next day game, we had to drive on right after the match. If there’s one thing we’ve learned at this point in the road trip, it’s that we could spend way more time than we have meeting up with all the great soccer fans along the road. Next up: Portland (or bust). 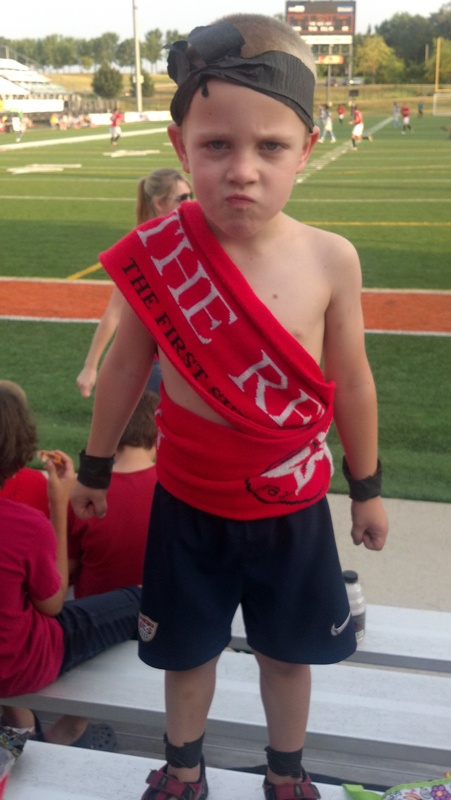 Truth is, I thought Chicago Fire had one supporter’s group: Section 8. I couldn’t have been more wrong. Section 8 is an association of supporter groups, that are all awesome and unique in their own right. 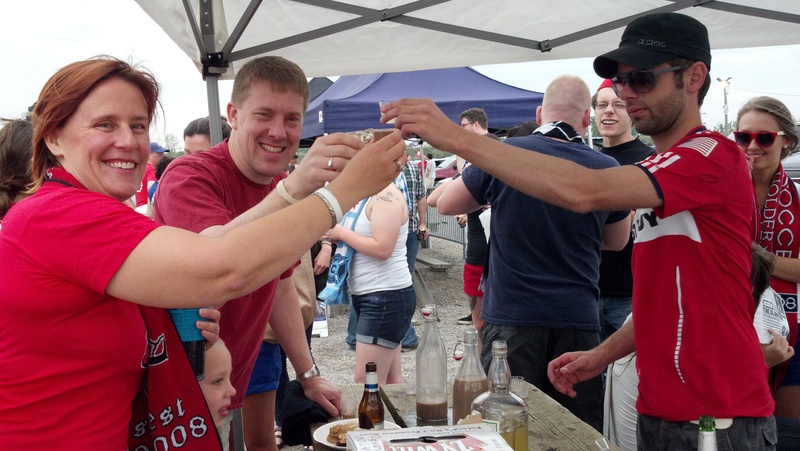 I had a great chat with one of the founders of Whiskey Brothers about the history of their group and the Fire supporters in general. Some groups formed out of ethnic groups, Hispanic or Polish, and some were born out of a group of guys drinking and starting a supporters group as a bit of a joke and had it take off unexpectedly, a story the certainly rings familiar as the somewhat accidental founder of American Outlaws Des Moines. 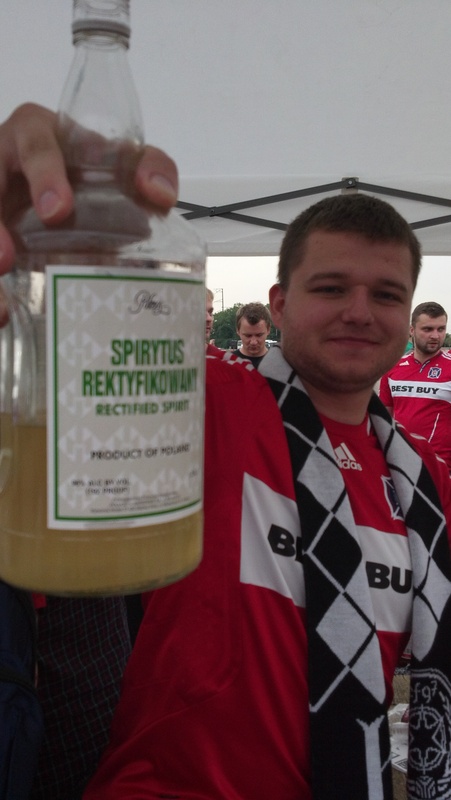 If you go to a Fire game, take some time to tailgate and meet the various groups. They have their own personality and are full of great people. We hit it off with Husaria, the Polish supporters group. My husband is mostly Polish, and I’m part Polish too, but more importantly, when you buy their merch, you get to drink shots of some crazy Polish drink that is serious business, even thinned. Plus, their shirt with the supporter holding a lit flare over his head and the Chicago stars looks really good on my husband. Great booze, great merch…yeah…I’m home with Husaria. 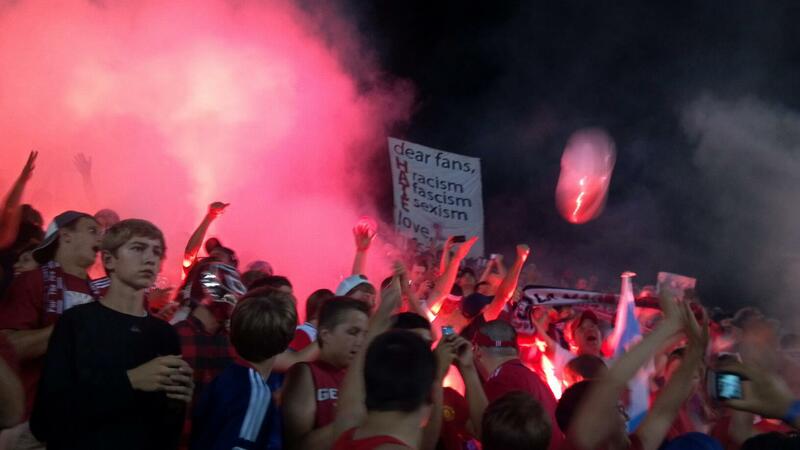 As if that wasn’t enough, they had a great anti-racism tifo complete with flares. I think I’m in love.